I've posted and guest posted quite a bit recently on my travels in Macau and all of the unexpected treasures, whether it was a cutting edge art gallery exhibition in a colonial-style building, or a secluded garden or a hiking track that's smack in the middle of the city, but feels quite remote. Recently, Pat Boyle at the Travel Show on KPAM 860 radio in Portland, Oregan interviewed me on Macau. I'd like to share with you some of the many curiosities I found, including a museum exhibit of caskets and tombstones reserved for prize-winning crickets (from the heyday of betting on cricket fighting); a hilltop summit that's home to a centuries-old fort, chapel and lighthouse (the oldest on the China coast); and a jogging path where quite a few of the locals jog on a sweltering day barefoot. Listen to this radio interview and you'll see why I fell in love with Macau, a place that has something for everyone, including those gastronomes or oenophiles in your group. This is a place I would love to go, but it seems so far away. Thanks for telling us in America about it! Hi Jennifer, Yes, it was a very long flight: 18 hours including the stop-over in Vancouver. Thanks for your kind comments. This sounds like a wonderful place to visit. Feels very exotic, distant. What a lovely photo. I also have Macau on my list of places I'd love to visit. A friend of mine recently went there with her toddlers, and said everyone they encountered was extremely friendly and helpful with the children. Hi Katherine, I found the people in Macau to be extremely gracious and willing to help, especially when I needed directions. Traveling to Macau with children is perfect because there's tons for them to enjoy, including racing cars in the Grand Prix Museum as well as exploring the cool boulders in many of the city parks and gardens. Hi Meredith, It's interesting how Macau had this blend of the exotic as well as the familiar. There were many times where I'd encounter a town square that felt like it was right out of Western Europe. It's a nice mix. 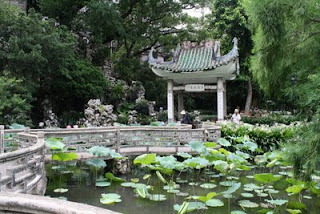 How I would love to spend more than the one day we spent in Macau--and without the rain. We spent most of our time in the old Portugese part of the city trying to find somebody who sold umbrellas! Hi Vera Marie, Oh, I'm so sorry the weather didn't cooperate for you when you were in Macau. I had just a brief bit of rain on one day. The rest was hot and stifling, the way I love it, seriously. I would be hard-pressed to even find Macau on a map. Sounds like an amazing place to visit. Thanks for the info. Hi Ready Mom, You're not alone. Most everyone who I told about my trip asked "where is Macau?" Thanks so much for your comments.